Powerful Bible principles to become a confident, beautiful, appreciated wife! 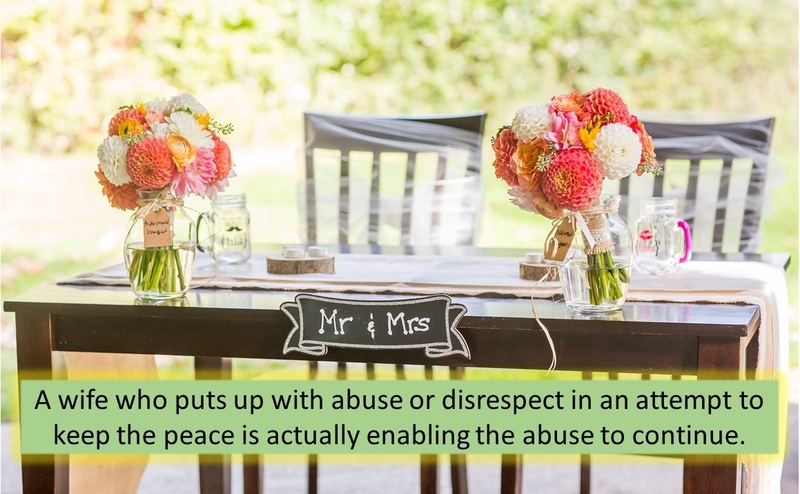 It is not okay for your husband (or anyone) to treat you disrespectfully. Let me just say that again. It is not okay. I know far too many beautiful, kind Christian women who, for some reason, allow themselves to be verbally, emotionally, or physically abused by their husbands or boyfriends. It’s heartbreaking. I heard yet another story from a highly-intelligent, gorgeous woman recently. She came to me in despair, wringing her hands over her abusive situation. Yet, she didn’t clearly see that she needed to draw a firm boundary and impose consequences on such behavior. In her case, she needed to leave until he showed serious, sustained repentance. Ladies, do you think God winks at a man who is abusing his wife or girlfriend? Absolutely not. In fact, God tells husbands they are to lay down their lives for their wives. Ephesians 5:25 says, “Husbands, love your wives, just as Christ loved the church and gave himself up for her.” If your husband or boyfriend is emotionally, verbally, or physically abusing you, you need to take a stand. If you don’t take action, you’re basically enabling his destructive behavior to continue. Read Matthew 18:15-17 and ask God to reveal His plan for you to take a stand when someone is sinning against you. How to make sure your husband is thinking of you!